The Collector's Edition of The Elder Scrolls Online: Morrowind included additional exclusive content. A copy of the base game. A copy of Naryu's Journal. A 12" Dwarven Colossus statue. A Dwarven War Horse mount. Access to the Morag Tong style in the Outfit System regardless of motif knowledge. A Collector's Edition Grey Bear skin for the Warden War Bear skill. Exclusive character emotes (Belly Laugh, Go Quietly, Kiss This, and Teatime). The Discovery Pack, which was otherwise only available by pre-ordering. 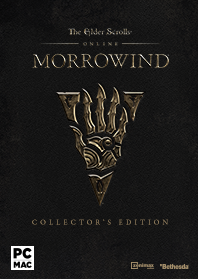 The Collector's Edition can no longer be purchased, although the above digital content is available in the Morrowind Collector's Pack released alongside Update 18. This page was last modified on 24 February 2019, at 01:42.